Time travels forward, but for humans, it goes in spirals, with each new year forward replaying familiar holiday cycles and bonds. 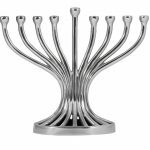 It's the penultimate day of Chanukah, the seventh of the eight days of celebration. Last evening, just as sunset was approaching, I set up and lit my new Chanukiah (Chanukah candelabra) to enjoy its warmth and welcoming light. The candle flames, at once familiar and comforting, glowed in their new arrangement, reminding me of many other firsts this year: that I haven't bought a new Chanukiah in decades; this is my first celebration of Chanukah as a resident of the USA since I was a teenager; and, in keeping with life in a very remote region, this was my first time buying a Chanukiah by online ordering. Yet, the many themes to this חג האורים Holiday of Light remain comfortingly constant over time. After lighting the candles, I always look forward to sitting next to them; this year it was by a little table at my front window to enjoy the many images that arise as the burning candles glow. A Festival of Light. It gets dark early now, and it is truly dark here in this official Dark Sky Community. No street lamps or outdoor lights are allowed here unless they are blunt and point downward. The natural rhythms of night and day are much more activated. The impact of how special and sacred lights may have been in Maccabean times is keenly experienced here. 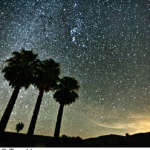 Stars explode forth and blanket the sky when the moon is new or waning; animals are busy with owls hooting, coyotes yelping, bats squeaking; bedtime shifts from midnight to 9pm. Lighting candles reminds us of our human ability to adjust the rhythms of nature, but not nature itself. Tradition! 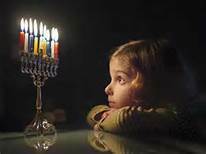 Just like in the song from 'Fiddler on the Roof', lighting the candles at the appointed time of year and singing the special blessings provides a familiar landmark in the onward unfurling of the unknowns that lie ahead. Even still, as I hold the lit shamash candle and gently touch each candle in the proper order, a liminal time machine transports me back into the amazed and agog infant/toddler, brown eyes brightly reflecting the magical flames of the pretty rainbow candles, taking in the warmth and light when so dark and cold outside, the smiling faces of family as they watch our little countenances transfixed with the first rapturous gasp of the glowing candles, the familiar songs, and Chanukah foods. Rededication. This for me is the core of what Chanukah is. What does that mean, rededication? The story of the Maccabees tells us about how these brave warriors prevailed over Antiochus IV and recaptured the Great Temple in Jerusalem. Antiochus had enacted a series of harsh decrees against the Jews, such as worship was forbidden; the scrolls of the Law were confiscated and burned. Sabbath rest, circumcision and kosher dietary laws were prohibited under penalty of death. And worse, many Jews had adopted Hellenistic ways, wanting to assimilate rather than endure harsh punishment. The Maccabees prevailed and were able to remove the pagan idols, foods, and installments, and restore the Temple to its Jewish ritual purity. 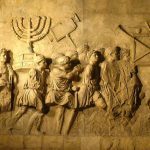 The underlying theme is that the Jews themselves had left behind their own traditions and either heeded the siren call of the indulgent Hellenistic lifestyle or allowed themselves to be coerced into it. Taking exception to this, the Maccabee Hasmonean family, some think of them as the 'Jewish Taliban', were strong-handed in their ways of upholding Jews to their Jewish values. Yet, if it weren't for that zeal, Judaism may have become assimilated and absorbed beyond recognition. They fought to keep Judaism pure and as a living faith tradition. Did they succeed? Well, look what happened to the Seleucid and Greek Empires (hint: they're gone). Jews are still around and lighting Chanukah candles to celebrate the miracle of surpassing that danger. By reflecting on the benefits of observing our Jewish traditions, even if they may be obscure or droll, we can stand up to and say "No" to diversions. We can recall the value of our traditions and rededicate ourselves to our core values of study, giving charity, and doing good works in the community. We can resume with fresh dedication our core practices of how we worship, eat, dress, care for one another, and observe Shabbat. 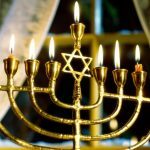 As each new year of Chanukah arrives, it simultaneously creates new lights and rekindles old memories; it mingles stories of heroic and dedicated ancestors with modern day challenges to preserving Jewish traditions. What is familiar helps us to undertake the new. Whatever your spiritual grounding is, be it a religion or faith, nature, or a chosen community of fellowship, take this time of winter night to remember and recall, and rekindle you inner sparks of light. Happy Chanukah, Holiday of Lights!